Season 4 of Fear The Walking Dead was all about second chances. Second chances for these characters to make up for events that happened in the past, but more importantly, it’s a second chance for the series to lure fans of TWD back into the fold of this spin-off series. After the big crossover event between franchise shows, then killing off original main characters, a storm was brewing on Fear The Walking Dead. But a new antagonist who was introduced during the last half of the season was the thing that drove these survivors crazy (along with this writer). The audience had never seen the effects of a Zombie-hurricane (or Hurricane Walker, as Chris Hardwick called it). A massive storm swamped and separated these survivors into separate locations and a new evil presence prevented them from moving on to Alexandria, with Morgan leading the charge. Tonya Pinkins’ Martha, always seemingly coated in dirt, is a selfish character who doesn’t really have a true reason to kill others. She’s misguided in her reactions to those who are willing to help out in any way that they can. Much like the main characters, sometimes their intentions aren’t pure. Sadly, Martha’s rushed introduction and resolution within six episodes felt like a time filler. Each of the main characters want to make up for events that have happened in the past. Throughout the season, their actions reflect this perspective. John Dorie is still the best character on the show, even if he doesn’t get enough of the spotlight. Luci had a little more involvement with the overall storyline (although the character still feels left out, for the most part, in doing anything substantial in the show). Victor’s life revolves around the bottle. A new pair of characters (a brother-sister combo) involves eye-rolling nicknames and a disability that impedes quick escapes. And Morgan has oddly become the moral compass of the show, constantly trying to fix others’ problems. By now, you should realize that anyone who inherits that role doesn’t have long to live within The Walking Dead Universe. Beer became a minor plot in the last half of the season. Jim (Aaron Stanford), an award-winning brewmaster was kidnapped for his knowledge and brewing experience. These characters have plans on building a new society with his adult beverage (Augie’s Ale), along with having a sort of relief during the Zombie Apocalypse. There’s a callback at the end of the season finale, “…I Lose Myself” that brings the topic to full circle. As a writer and a homebrewer, I really enjoyed that topic, even if Jim’s character made all brewers seem petty and outlandish. Morgan has brought this group of strangers back together, so why is he constantly leaving them to go on solo missions? Madness, I say. Abandoning his season-long goal to return to Alexandria, he decides to continue Polar Bear’s supply system of helping others in need, now based inside a denim factory, with truck stops and roadside drops factoring into the ongoing survival scenario. This goal is his (along with the others) new reason to live. While a vocal portion of the fanbase is upset with the new direction for Fear, I’ve been leaning in the opposite opinion. In the beginning, the show suffered from bad writing, bad directing and even bad acting. With the new showrunners (and new actors), the series has definitely improved for the better. While most of the original actors have been killed off this year, it was a good move, storywise. The series needed a jump start into a new direction. 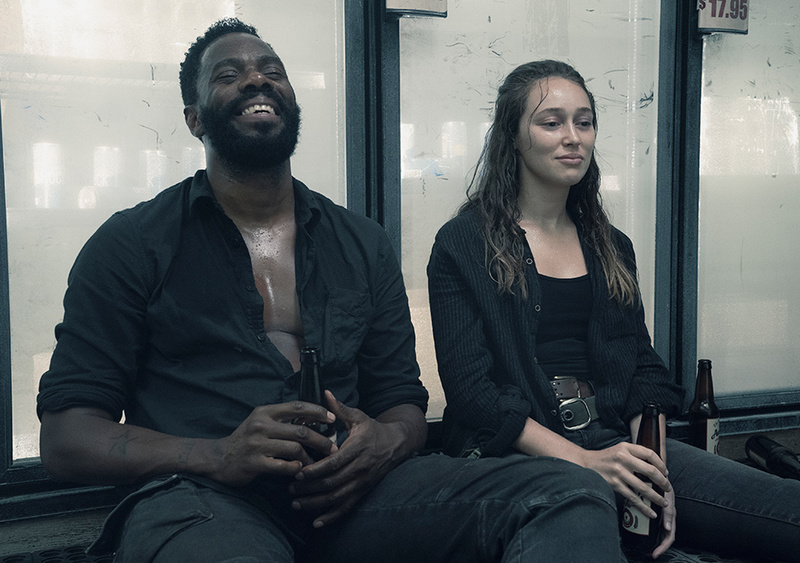 At the conclusion of this season, the only remaining original actor is Alycia Debnam-Carey, who has improved as a character without being surrounded by her family. If these original fans survived to watch the entire season, they would realize their complaints were unfounded. But it wasn’t a perfect season. Far from it. Storylines were going in multiple directions. Not all of them were resolved, but the show simply moved away from them, onto something new. There were time jumps that made sense for a bit, but then felt monotonous later. Characters made ridiculous decisions for no good reason (much like in TWD), resulting in unnecessary drama. But after all of this, Season 4 still feels light years better than the previous three seasons, but it felt like the series was wrapping up.